This is a plein air piece from last year’s University City Plein Air event. That evening after the event, I painted with Sandy Graeser Haynes on the grounds of the Community Center. It was pure pleasure. This painting is a 9×12 oil on panel. I’ve been going through some of my older paintings trying to decide whether they are worth saving or just junk! 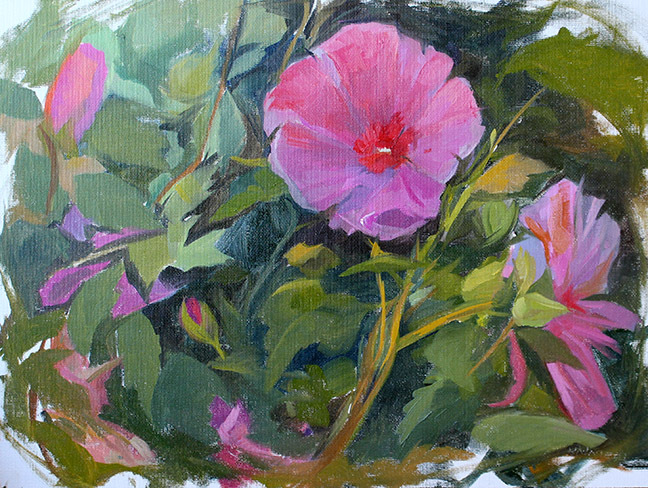 This entry was posted in Uncategorized and tagged floral, flower, green, hibiscus, pink, plein air, ucity. Bookmark the permalink. Hi Linda. The link to your comment took me to a pic of hibiscus. Is that the painting you mean? If not, I do have a mandevilla painting I could post.